Leek St. Edward The Confessor Parish Register Transcripts Part 1 Baptisms, Marriages & Burials 1634-1694 This is a downloadable PD..
Leek St. Edward The Confessor Part 2. 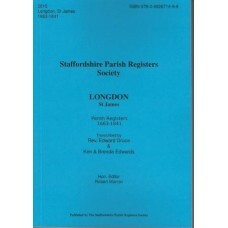 Baptisms and Marriages 1695-1698 and 1700-1730, Burials1678-1707 Parish Register Transcripts This is a ..
Leigh All Saints Parish Register Transcripts Baptisms 1541-1841, Marriages 1551-1837, Burials 1541-1837 This is a downloadable PDF fileNow..
Lichfield Cathedral Church Of St.Mary and St.Chad Transcripts Baptisms and Burials 1660-1744, Marriages 1665-1754 This is a downloadabl..
Longdon St. JamesParish Register Transcripts 1663-1841 254 pages Book format, also available as a download Published by the Staffordshi..
Longdon St. JamesParish Register Transcripts 1663-1841 254 pages Published by the Staffordshire Parish Registers Society This is a downloadab..
Maer St. Peter Staffordshire Parish Registers 1558-1746 This is a downloadable PDF fileNow with a clickable index File will be available as s..
Marchington St. PeterParish Register Transcripts 1609-1900328 pages Published by the Staffordshire Parish Registers Society This is a downloadab..
Mavesyn Ridware St. Nicholas Parish Register Transcripts Baptisms, Marriages and Burials 1538-1812 This is a downloadable PDF fi..
Milwich All Saints Parish Registers CD Format Baptisms, Burials and Marriages 1573-1812 Also available as a downloadable pdf file ..
Milwich All Saints Parish Register Transcripts Part 1 Baptisms 1573-1742. Marriages 1574-1711. 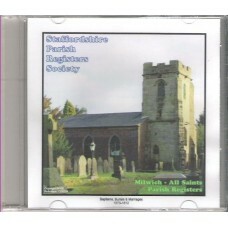 Burials 1573-1711 This is a downloadabl..
Milwich All Saints Parish Register Transcripts Part 2 Baptisms, Marriages & Burials 1713-1812 This is a downloadable PDF file ..
Milwich All Saints Parish Register Transcripts Part 1 - Baptisms, Marriages & Burials 1573-1711 Part 2 - Baptisms, Marriages..
Mucklestone St.Mary Parish register transcripts Part 1. 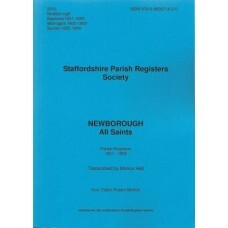 Baptisms, Marriages and Burials 1555 -1701 With Clickable Index This is a download..
Newborough All Saints Parish Register TranscriptsBaptisms 1601-1899Marriages 1602-1900Burials 1855-1900 197 pages Book format, also available as..
Newborough All SaintsParish Register TranscriptsBaptisms 1601-1899Marriages 1602-1900Burials 1855-1900197 pages Published by the Staffordshire Pari..
Newcastle-Under-Lyme St Giles Parish Register Transcripts Part 1 Baptisms, Marriages and Burials 1563-1705 This is a downloadable..
Newcastle-Under-Lyme St Giles Parish Register Transcripts Part 2 Baptisms, Marriages and Burials 1705-1770 This is a downloadable..
Newcastle-Under-Lyme St Giles Parish Register Transcripts Part 3 Baptisms, Marriages and Burials 1771-1812 This is a downloadable..
Newcastle-Under-Lyme St Giles Parish Register Transcripts Parts 1-3 Baptisms, Marriages and Burials 1563-1812 This is a set of 3 ..